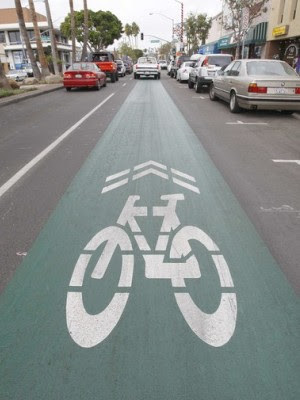 In Long Beach California, the city has decided to install "sharrows" to make the roads safer for cyclists. According to a recent article in the Los Angeles Times, the sharrows first caused confusion and drivers didn't know what they were supposed to do. The coordinator in charge stated that the sharrows help demonstrate the law which allows bicyclists to ride along with traffic. Of course some drivers are upset that bicyclists are forcing them to slow down. The City is also planning to get ride of parallel parking on the sides of busy downtown streets and replace it with bike corrals in addition to adding full lanes just for bicyclists. California often leads the way for the rest of the country with regard to somewhat controversial but oftentimes great ideas. Riding down the middle of the lane in busy areas like the above seems much safer than riding the far right where people are constantly parking, opening doors, and pulling out. Let's hope the sharrows and bike lanes catch on in other cities like Madison, Wisconsin and also that the sharrows continue to increase driver awareness of bicyclists and make the roads safer to ride.